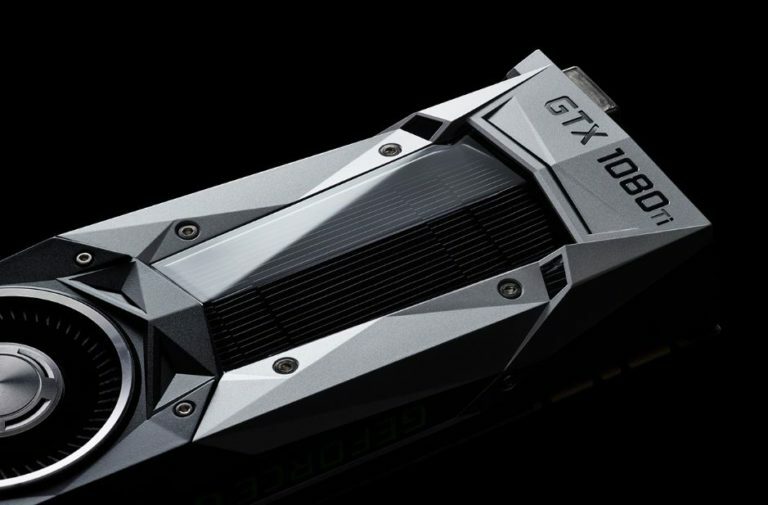 It is now a short time before NVIDIA launches its new NVIDIA GeForce GTX 1080 Ti. It is confirmed by the quandl– a top graphic of range that aims to satisfy the needs of players looking for the Better performance regardless of cost. Of course, a high cost graphic has to fulfill several premises to succeed in the market, and that is precisely what we want to speak to you in this article from our personal perspective. The bad statement from NVIDIA that they already prepared the presentation of the NVIDIA GeForce GTX 1080 Ti for this year’s CES, but they canceled it at the last minute to see that AMD did not present any relevant information about VEGA during the fair. The PAX that will take place from March 10 seems to be the date chosen finally for the presentation of all Pascal architecture graphics that the green ones have in the room, including this NVIDIA GTX 1080 Ti of which we speak in the today. The alleged presentation in the PAX is not confirmed, although it is true that comes from an MSI spokesman who also said that there will be customized graphics by the assemblers from the outset. The graphics card market is getting fiercer, and with the making AMD Vega presentation, NVIDIA must put the sets if it wants to take the cat to the water. Although for some time now they have been showing that their level of sales is better than the one of AMD. Even if in question of prices cannot or do not want to make the competition to them of red. Things go quite well with this business model, so changing it – which would bring you fewer direct benefits. So, this is a graph that will be very expensive, and if we take into account the price of the GTX 1080 you can expect a base price of between 900 and 1,000 euros easily. What can you offer to users for this price? Under our personal point of view the key is going to be the game at 4K resolution. Nowadays no graphics market can guarantee playing 4K resolution with all the graphic adjustments. To the maximum while keeping the desired stable 60 FPS, and given the zeal with which we are getting 4K resolution by the eyes for a couple of years. This should be the key point. Personally, if I have 1000 euros to spend on a graphical solution I would only do it if I have the guarantee that I will be able to play 4K and 60 FPS without the slightest inconvenience. Otherwise I would opt to spend that money on an SLI configuration, it’s that simple (two GTX 1070s in SLI cost less than that money and pretty much guarantee it). Another factor that NVIDIA should focus on for the GTX 1080 Ti to succeed is beyond performance. Small form factor systems, quiet and efficient are the order of the day, and those of green must repeat the good work they did in terms of efficiency with the GTX 1080, which only needed a single 8-pin connector to operate. If the GTX 1080 Ti needs more power from the power supply personally I will consider it a failure. But we are talking about a graph of 1,000 euros, and reaches the point where performance and efficiency should not be enough. As we said before, according to MSI from the first moment will be launched customized graphics, but if NVIDIA launches its own version as the Founders Edition must innovate in some way in terms of design. The new heatsink of NVIDIA benchmark graphics has proven to be decent enough to be blower-like, but I honestly believe that this type of heatsink is seldom liked by users. NVIDIA must renew the heatsink of its reference models and do it for a version that gives us better temperatures but above all a greater silence. As expected, we can now officially talk about the Nvidia GeForce GTX 1080 Ti, graphics that uses silicon GP102 under Pascal architecture conformed by 3584 CUDA Cores along with 224 TMUs and 88 ROPs. Luckily, it has the same CUDA as the GeForce GTX Titan X and reaches a faster frequency of 1.60 GHz (vs. 1531 MHz) promising to reach up to 2.00 GHz by overclocking. 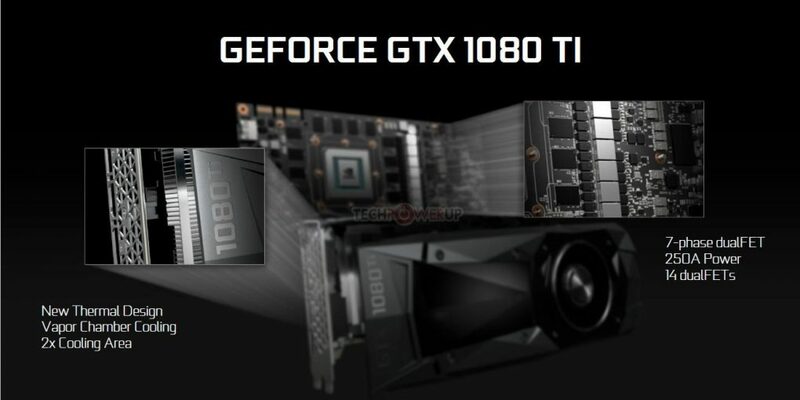 According to the company itself, we are facing the best GeForce GTX x80 Ti released, as compared to GeForce GTX 1080, the GeForce GTX 1080 Ti is 35% percent faster, compared to 25% that was the performance jump of the GTX 980 vs GTX 980 Ti and 18% of the GTX 780 vs GTX 780 Ti. This substantial improvement is due to new compression technology to improve bandwidth. The graph shown is the Nvidia GeForce GTX 1080 Ti Founders Edition, which employs the company’s benchmark cooling system which will have to deal with a 7-phase VRM power supply that will deliver 250A to the GPU. According to the company, it would be a slightly improved heatsink, and despite maintaining a 220W TDP, thanks to a new design of the steam chamber, the graphics will be 5ºc cooler than the GTX 1080 Founders and 2.5 dBA quieter. Although we are going, why deceive us, what interests will be the custom models of manufacturers like KFA2 / GALAX, MSI, Gigabyte, EVGA, etc, to get all the juice possible. Thanks to the overclocking of GDDR5X memory up to 11 GHz (vs. 10 GHz reference GTX 1080), the company promises that its graphics will size 5K resolutions in games like Deus Ex or Watch Dogs 2, perhaps in an attempt to Minimize collateral damage of a Radeon RX VEGA that will use the HBM2 memory that will benefit them to such resolutions. As for the price, best of all, its price will be 699 dollars (845 euros?) And will be on sale next week. Undoubtedly, a fairly logical and aggressive move by Nvidia that will seek to take all demanding players before the AMD Radeon RX VEGA go on sale, which obviously will have to offer an even more competitive price after this move To the defensive of Nvidia.